The 2016 Monte-Carlo main singles draw is out! Rafael Nadal has a bye in the first round. In the second round he will play either Aljaz Bedene or Lukas Rosol, the man who defeated him at Wimbledon in 2012. The King of Clay could have a potential quarterfinal with 2014 winner Stan Wawrinka and a semifinal with Andy Murray. The Monte-Carlo Rolex Masters is live from 10-17 April, 2016. This year will be the first time since 2009 that Big Four have all played together in the tournament. We wish our champ all the luck in the world for a healthy, highly successful clay season. Vamos Rafa! 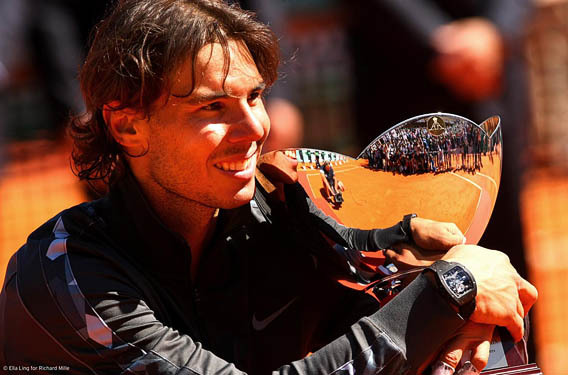 Previous Rafa Roundup: Never count out the King of Clay! Rafa please stop saying that Djokovic can’t be beaten, he is the best. He can be beaten, he is human like anyone else. If you go up against him with a positive mindset you can beat him. Please stop being negative but be positive. Love you and praying for you. I have a gut feeling Rafa has left his demons behind him and he is all ready for the clay season,we must never forget the great joy we witnessed from this great athlete over the years, We will witness it again this year. It’s all in the mind Rafa. You have the weapons to beat anyone. You are the king and The Master of Clay. Just treat them all as imposters and get back your Monte Carlo crown! Vamos Rafa, try to be yourself, play well and bite one more Trophy! Given his current form, the only way Rafa wins Monte Carlo, Madrid, Rome or Roland Garros this year is if Novak gets injured or beaten before they’re scheduled to face each other. And even then he would need a lot of other things to break his way in the draw before he could lift a trophy. In other words, DON’T COUNT ON IT. I for one will count on it.my adrenaline is already HIGH. No – you’re just “high” – period. Looks like a pretty good draw for our boy, except that horrible Rosol is lurking there! You can do it, Rafa. Supporting you all the way. I don’t think Rosol will be much of a threat on the clay for Rafa, but Thiem will be. Best of luck Rafa! Be calm, be happy, and be aggressive! Can’t wait to watch you play! All the best in Monte Carlo! You can do it! Be and stay aggressive and try to surprise your opponents! You are still the King of clay! Rafa Rafa please play like the real Rafa and not the body snatched Rafael Nadal. Swat aside the lower ranked players… try not to lose to them. Thank you! Good luck and Vamos Rafa!! !